Nice Snoopy PJ's on Duffy. 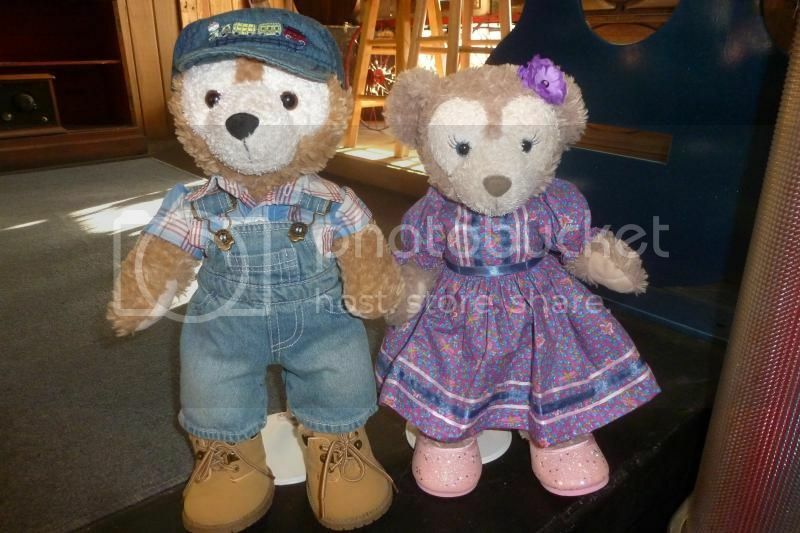 Duffy and Shellie in their Spring Voyage outfits, from its first appearance in 2012 to its current appearance this year. My favorite number is 13 and I like Friday the 13th, although I don't notice any special luck, good or bad, associated with that day. Last Friday the 13th, Duffy and Shellie May put on their wizard costumes and waved their magic wands and I won $6 on a lottery ticket. I asked them to help again. 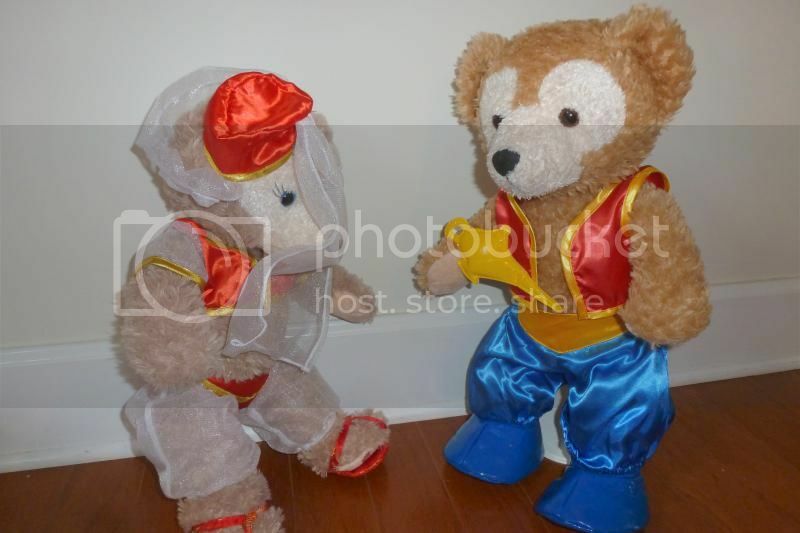 Duffy dressed up as Aladdin and rubbed his magic lamp. 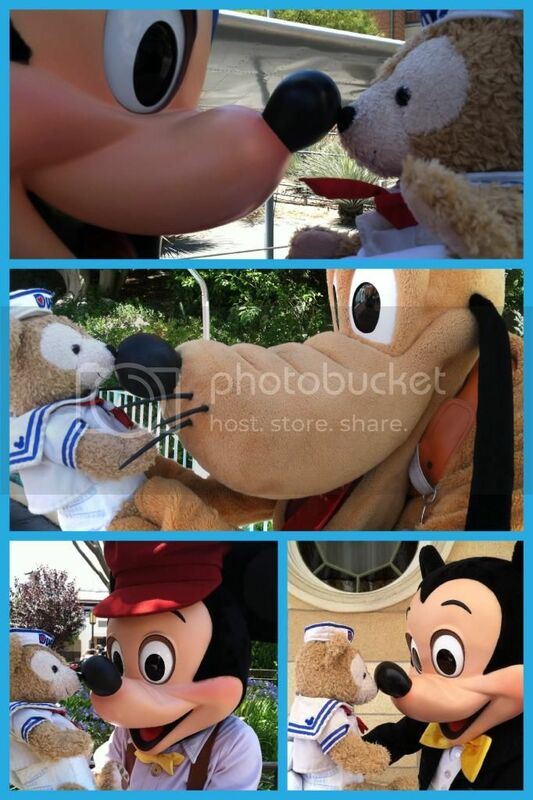 "Oh...it's just YOU," said Duffy. "You were expecting someone else?" asked Shellie May. 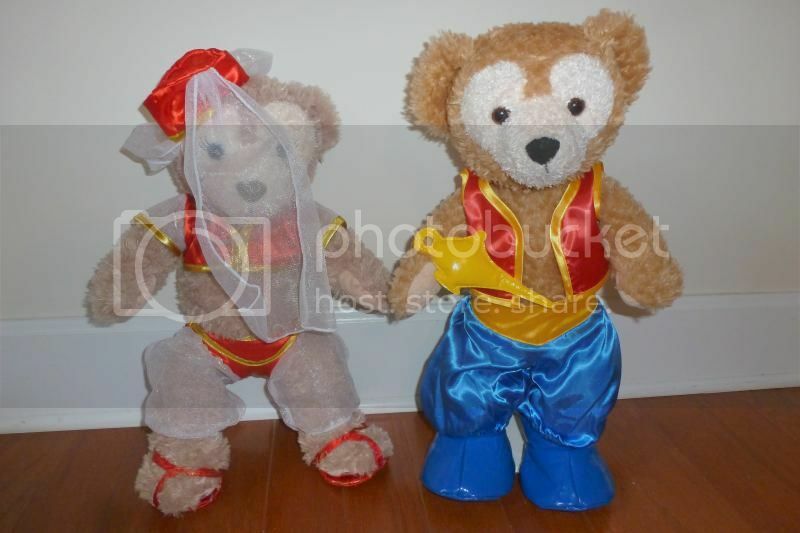 "Um, well, yeah," said Duffy. "An AUTHENTIC genie. Oh, well, I guess you'll do in a pinch. Come over here and help me bring luck to these lottery tickets." "Abracadabra, ala shazaam," said Shellie May. "Make these tickets worth lots of money....BAM!" 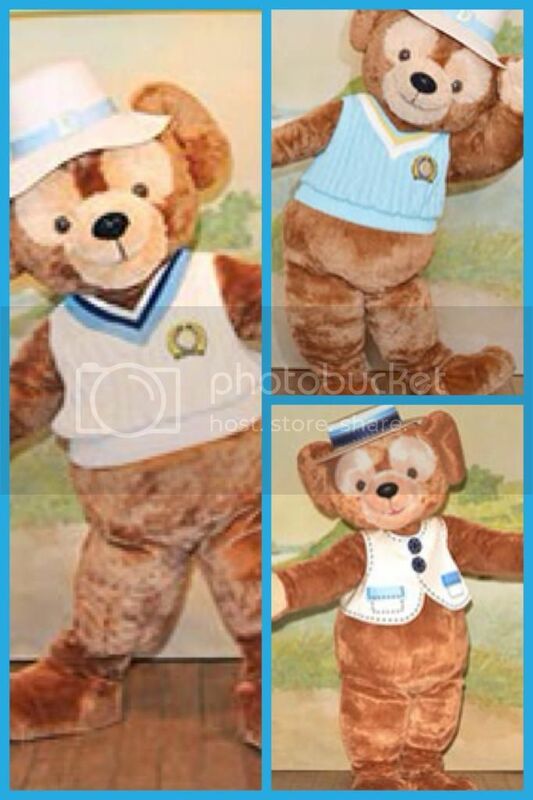 finished Duffy. I'll let y'all know tomorrow what happens. Nope, I didn't win anything. Bummer. Oh, well. 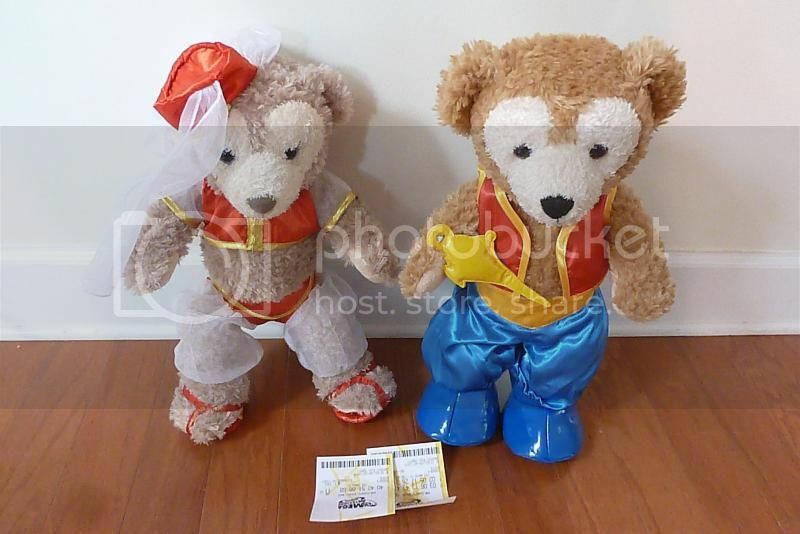 Here is Duffy and ShellieMay in their "Tanabata" outfits for Tokyo DisneySea's "Star Festival". It takes a lot to surprise me, but my mom managed. This was from her favorite bakery. What a great match for my other "birthday present"! That cake looks delicios, Eeee-va! Duffy is delicious enough to keep, and the cake is delicious enough to eat. The Disney tee is avail at DTD BAB in CA. I have tried to get them to ship to me and they won't. 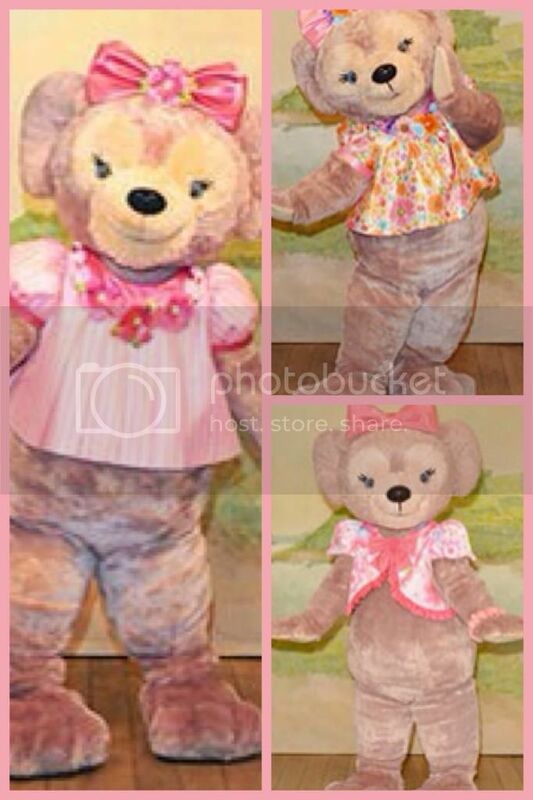 I have it, plus the pink one with Minnie Mouse. They come with earhats that light up around the patch. I have a friend in Californina who picked them up for me. If you have any friends who live near Disneyland, just ask if they can do they same and offer to PayPal them the money for it. I wish the Build a Dino at WDW had WDW versions, but they don't. Boo. No, I didn't make the kimono; got it on eBay It is actually a Dress Me Hello Kitty item. It's a bit tight at the bottom and a bit loose at the top, but not bad overall. The bow just has Velcro on the back, but I'll sew it to elastic at some point. Shellie May was just too excited to share even though she's technically several days early for the actual Star Festival, I think? I'm going to try on the other two I bought later and see how those fit. I went to the mall today and picked up a Bambi Tsum Tsum at my local Disney Store. Tsum Tsums are stackable plush toys that are popular in Japan (I've seen lots of photos of various ones my Japanese friends have posted on Facebook). US Disney Stores started carrying Tsum Tsums this week. 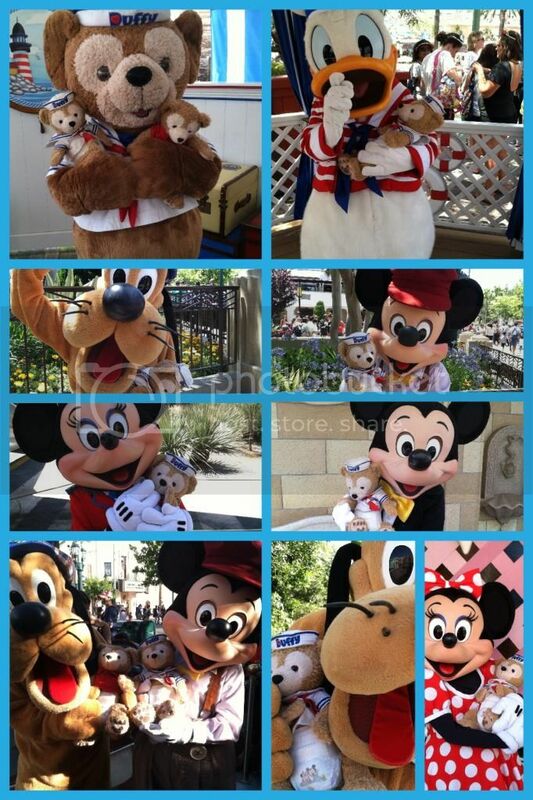 The little ones are really freaking cute and they have lots of characters like Bambi, Thumper, Miss Bunny, Mickey, Minnie, Pluto, Donald, Daisy, Stitch, Sulley, Pooh, Tigger and more! 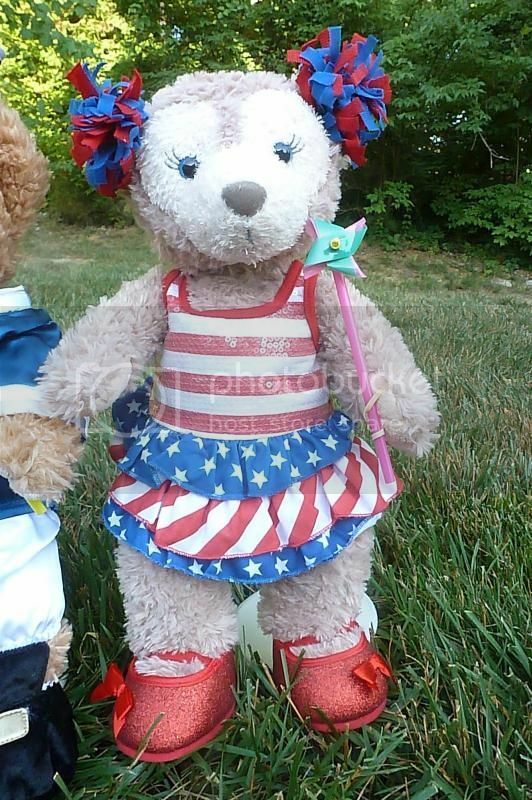 Patriotic Duffy did not have to stowaway this year since I am staying local for Independence Day. The Nashville Independence Day fireworks are ranked 2nd in the nation and I have never seen them; they are slated to last 27 minutes and be choreographed to music by the Nashville Symphony Orchestra. "That will be a BLAST!" 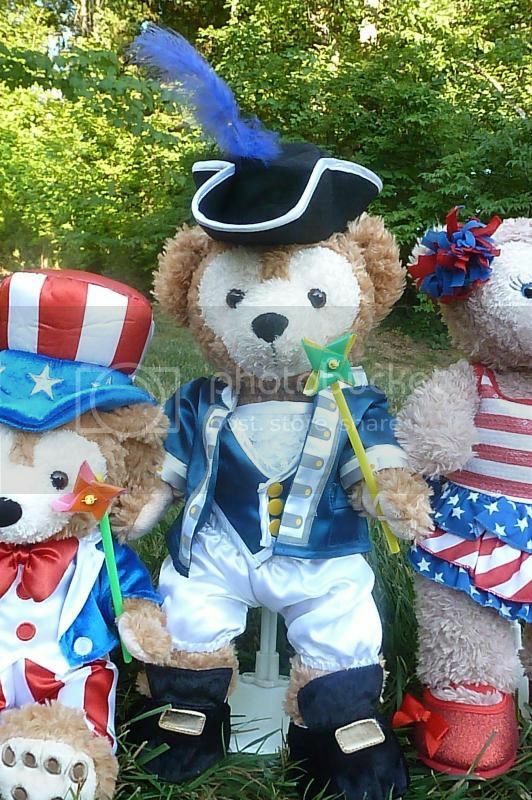 said Patriotic Duffy, "literally AND figuratively". 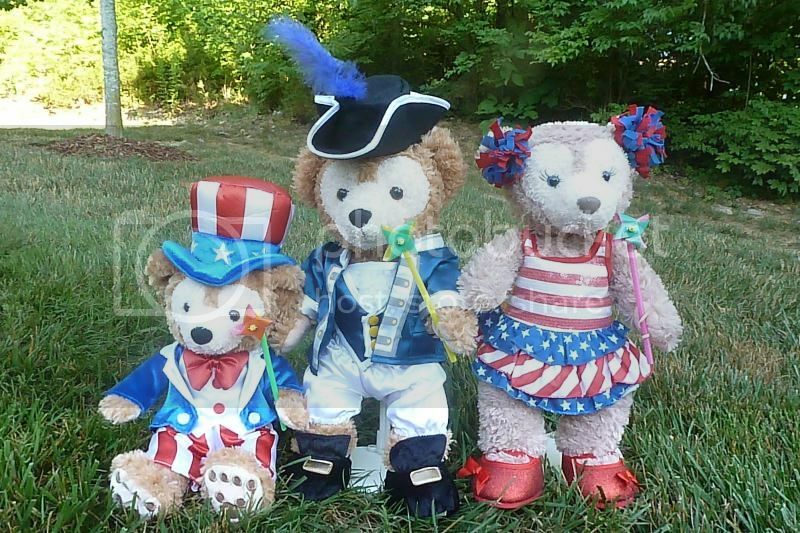 So here is Patriotic Duffy, Duffy dressed as an American patriot from Colonial times, and Shellie May wearing...WHAT?!??>! "Shellie May, are those your cheerleader pom poms in your ears?" Well, I learned long ago not to question Shellie May's fashion sense. 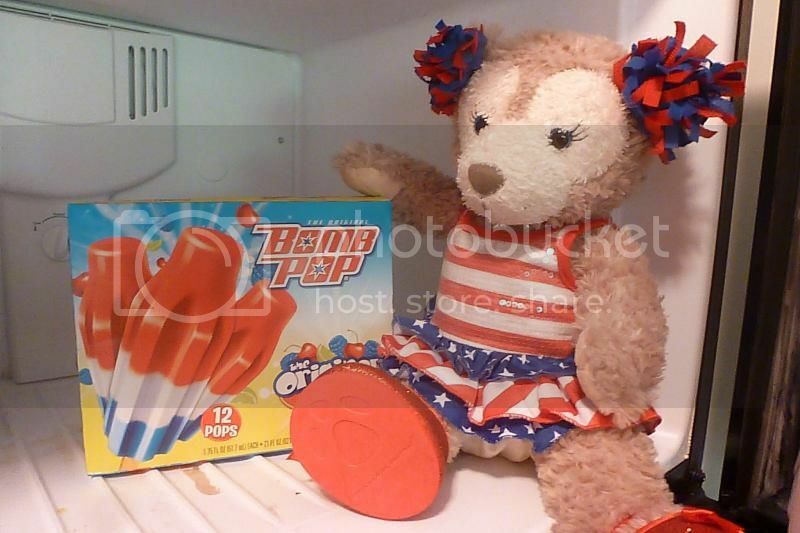 Shellie May then raided the freezer to get a Bomb pop treat. "Oh, my! Bears, why didn't you tell me we were out of food?" I exclaimed in surprise. They're eating me out of house and home (I guess constantly adding to the family doesn't help). 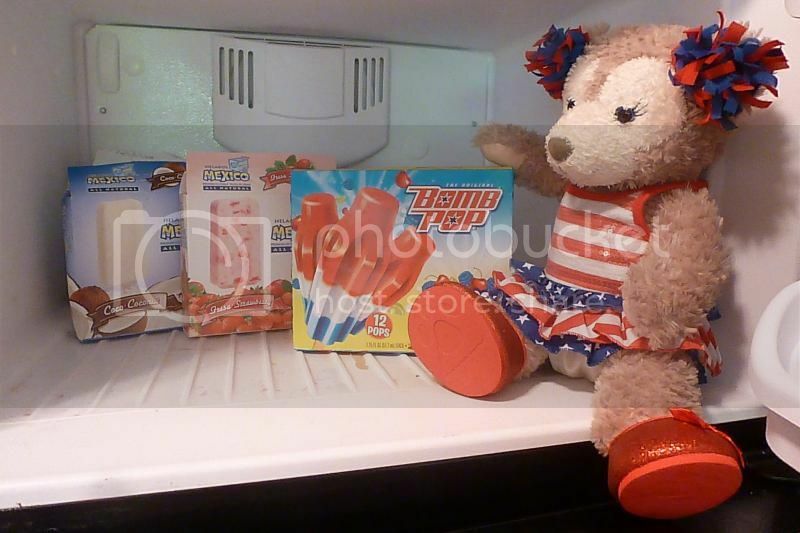 "As long as we have some ice cream left, it's okay," said Shellie May. "Yeah, and the nearest 24 hour grocery is less than 2 miles away. What is the big deal?" 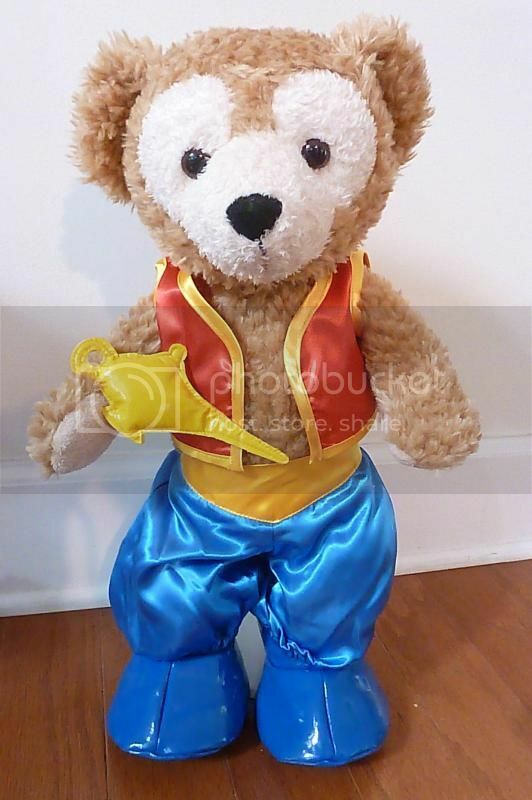 said Duffy. 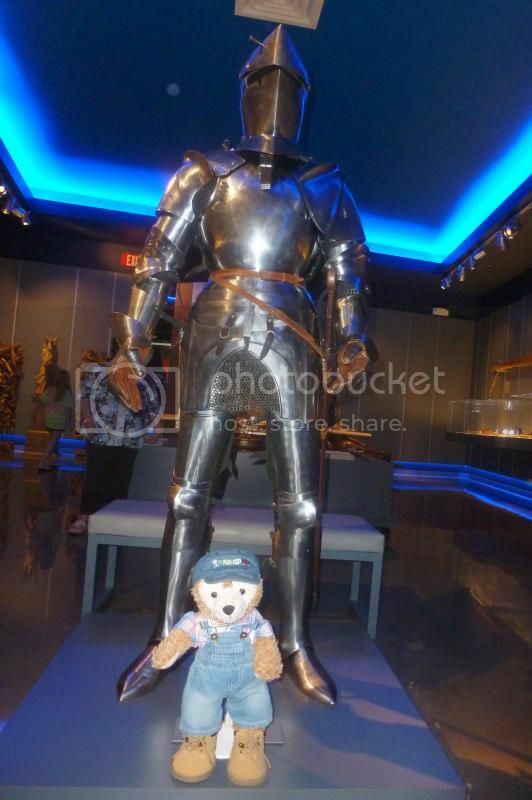 JillT, where did Colonial Duffy get his outfit?! 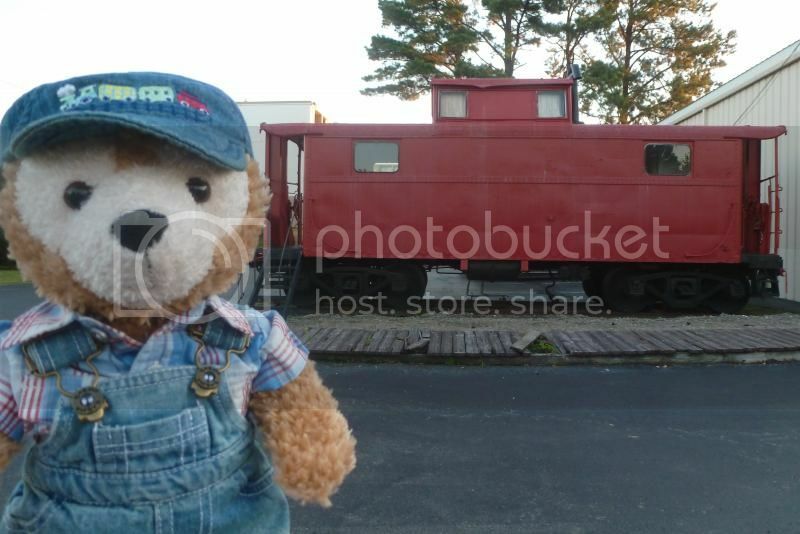 I got it online last year from Teddy Mountain. Saturday we went on a long day trip. 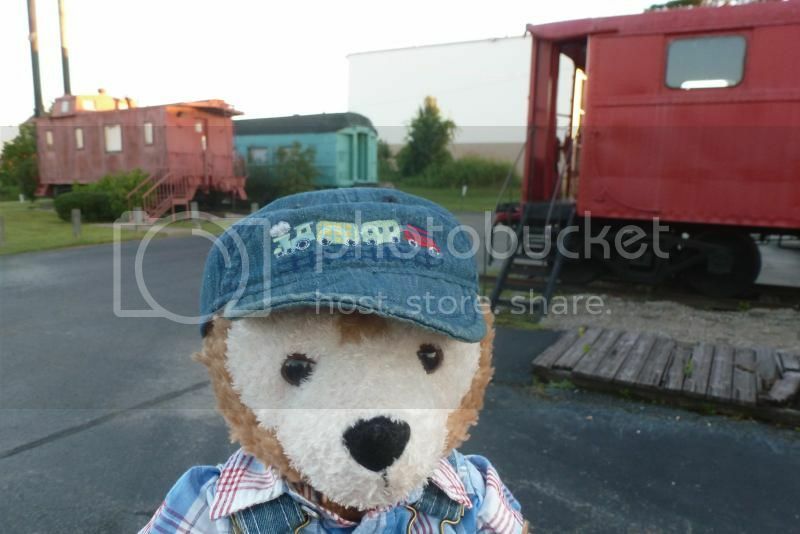 First we stopped at Casey Jones Village in Jackson, TN. 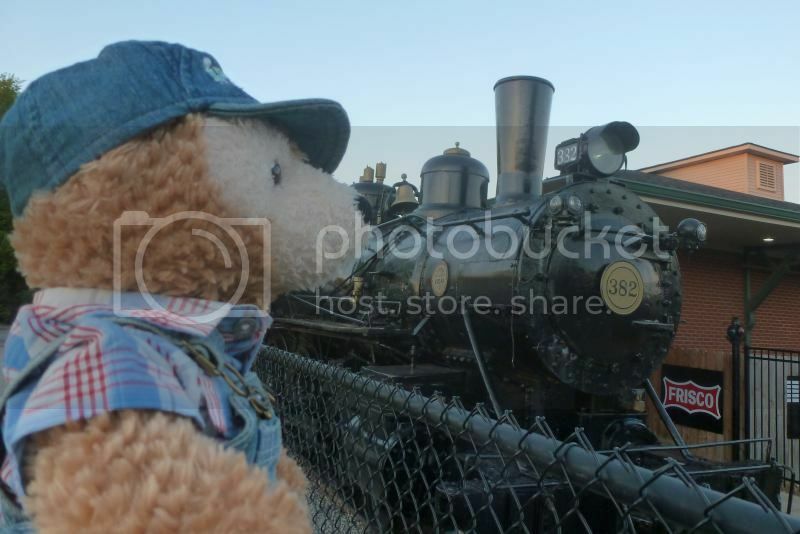 Duffy was enamored with all the trains and could hardly contain himself. "Take my picture here...and here," he said as he was running around. His enthusiasm was contagious. 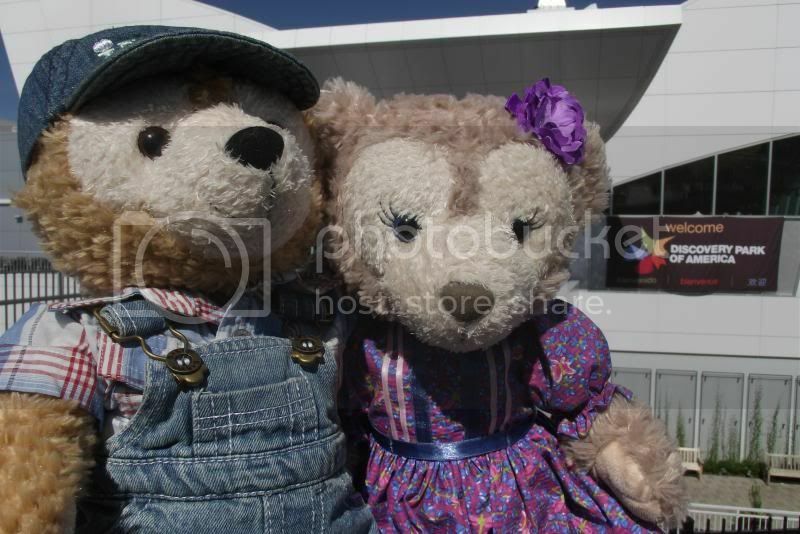 "I'll join you in this photo, Duffy," said Shellie May. Overall, though, Shellie May was more interested in food. The restaurant has a southern comfort food buffet (note, I was disappointed in the breakfast selection, but dinner is better). 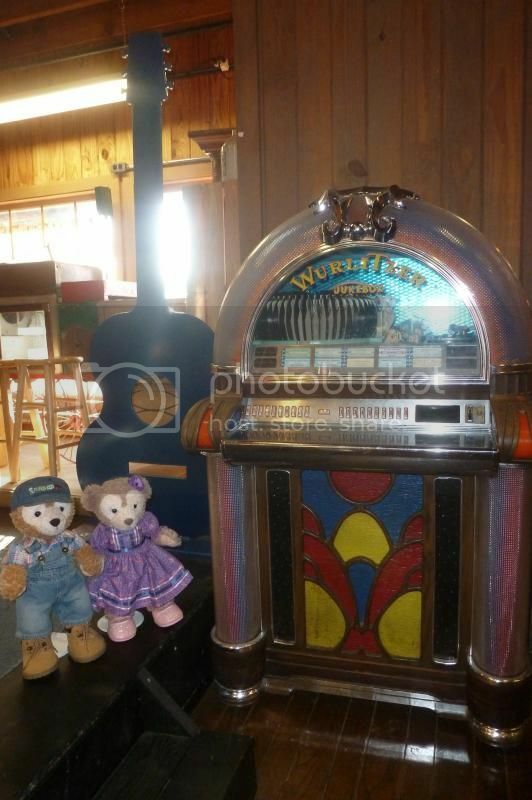 Once inside the restaurant and country store, Shellie May, ever the audiophile, became distracted by the juke box. "My stomach can wait," she informed me. 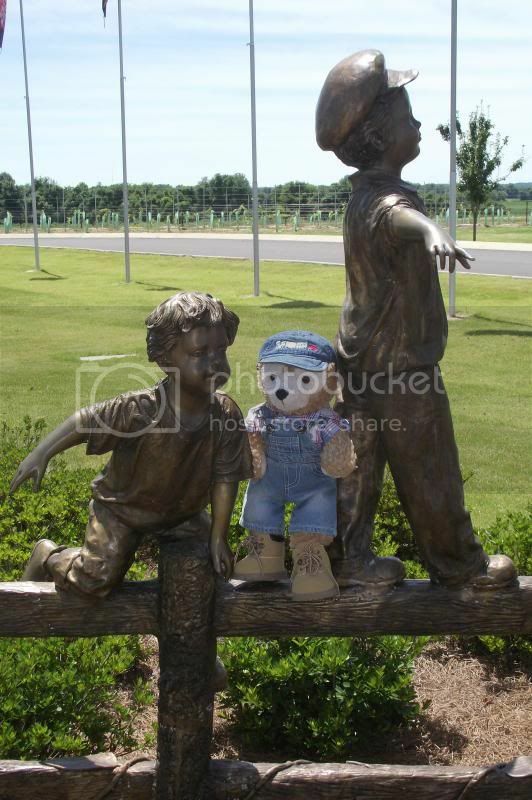 “Since you built it, we will come,” said Duffy of the Discovery Park of America in rural Union City, TN. Discovery Park of America opened in November 2013. It is actually built on a cornfield, near an old Goodyear tire plant, which closed in July 2011, taking 1,800 jobs with it. The lost jobs hurt the area's economy and residents' morale, but the future may be getting brighter. Office chair maker 9to5 Seating recently announced it's moving manufacturing operations from China to Union City, adding about 500 jobs. Union City resident Robert Kirkland, who built a fortune with a chain of home decor stores and smart investments, shelled out $80 million to build the museum, Kirkland plans to keep the exhibits fresh and unique with a $3 million annual investment. 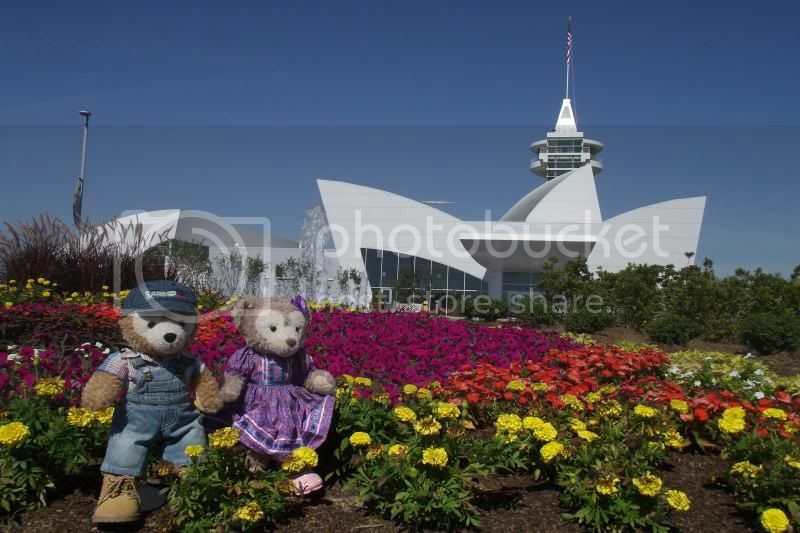 The park took 2 years to build and they hired local workers whenever possible. The idea is to bolster the economy in a region of rural America hit hard by job losses, floods, droughts and a tough economy. “Let’s go bring those people joy,” said Shellie May, when she read the human interest story online. 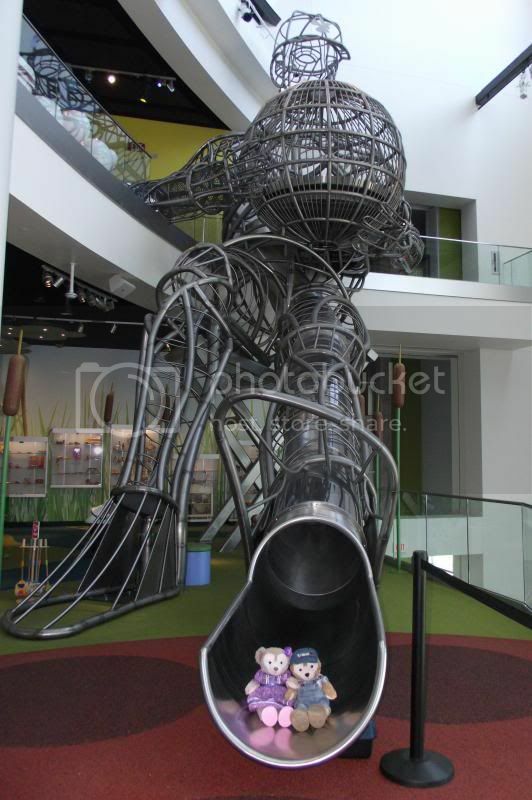 It’s a 3 story museum with 3 add-on activities, and outdoor grounds and exhibits also. It sits on 50 acres! Everyone on Trip Advisor so far, whether they be local, regional, or living far away, has given it 5 stars! "Look at all this!" 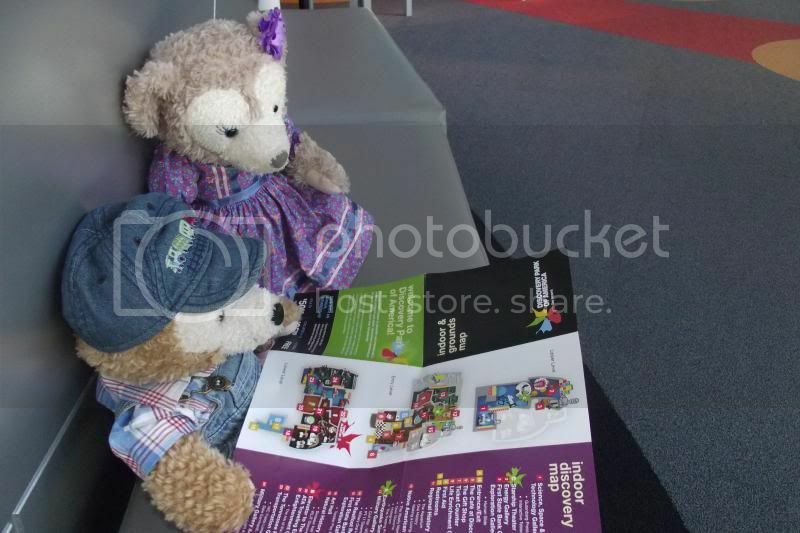 said Duffy, studying the map and plotting our course. 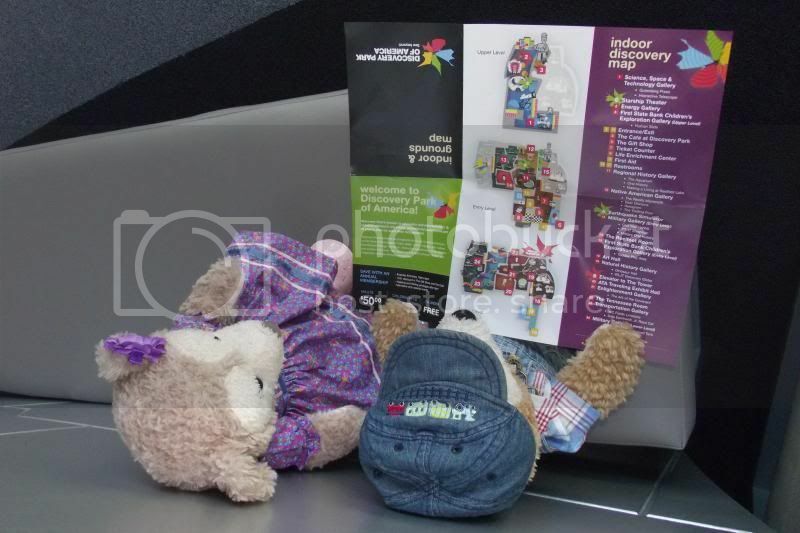 "Turn the map over; the other side shows all the outdoor exhibits," advised Shellie May. "Let's do this stuff first," said Duffy, who was getting a little bit overwhelmed, but in a good way. "I'm glad we woke up early to get here right when it opened," said Shellie May. 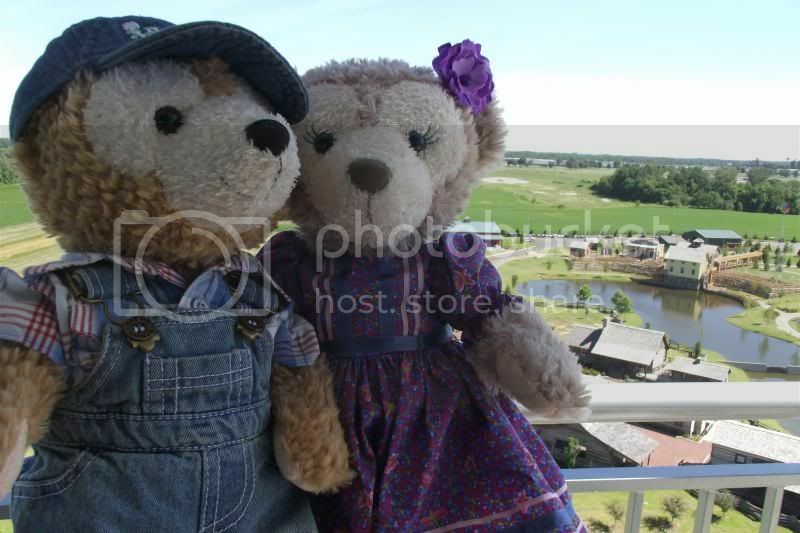 First we went up in the tower before it got crowded. You can see the dirt path for the expressway that is being built right next to the Discovery Park of America. Right now it's pretty much out in the middle of nowhere with corn fields all around. 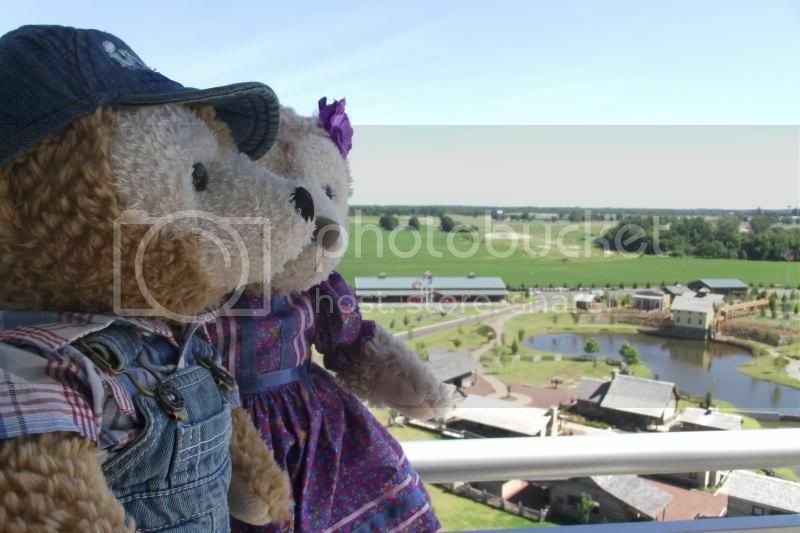 Da bears overlooked the pioneer village. "We're going to do that, too, right?" asked Shelile May. 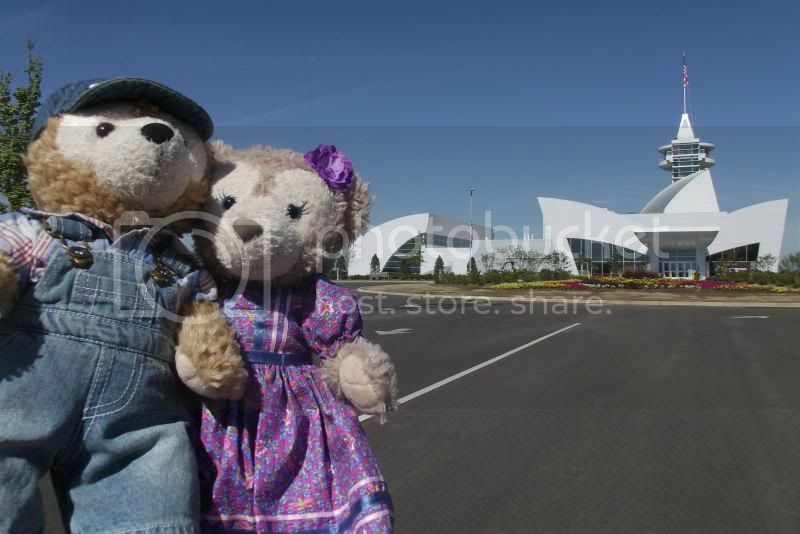 "Yes, the park is open 10-5 and we got here and were first in line for our ticket so I'm sure we'll see it all, Shellie May. Don't worry." 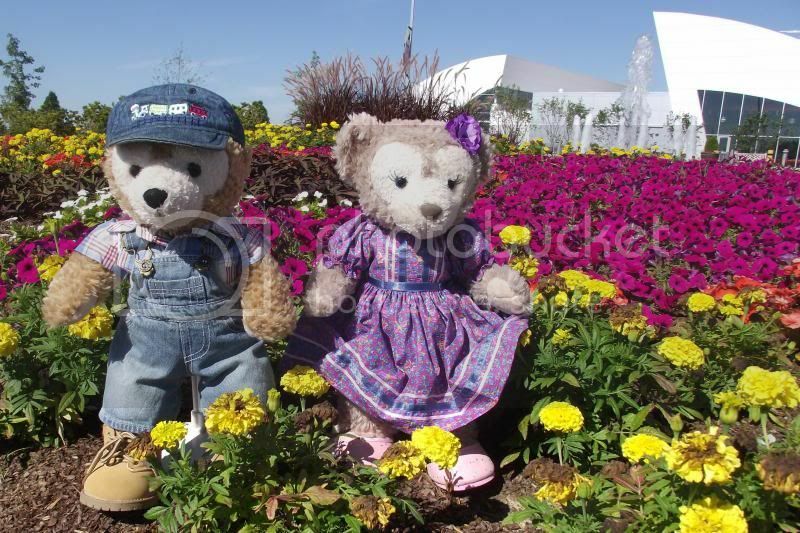 The park is 180 miles from Nashville. 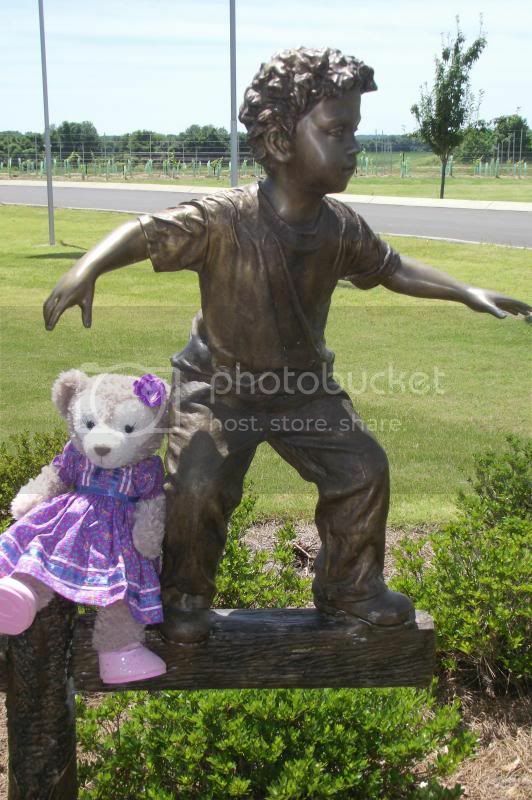 Kaylee from Mississippi took an instant liking to da bears. 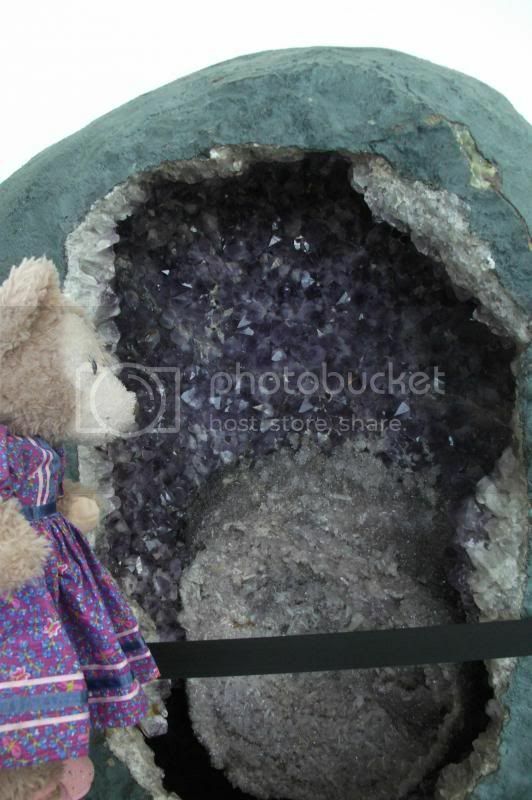 "Look at this giant amethyst, Shellie May," she said. 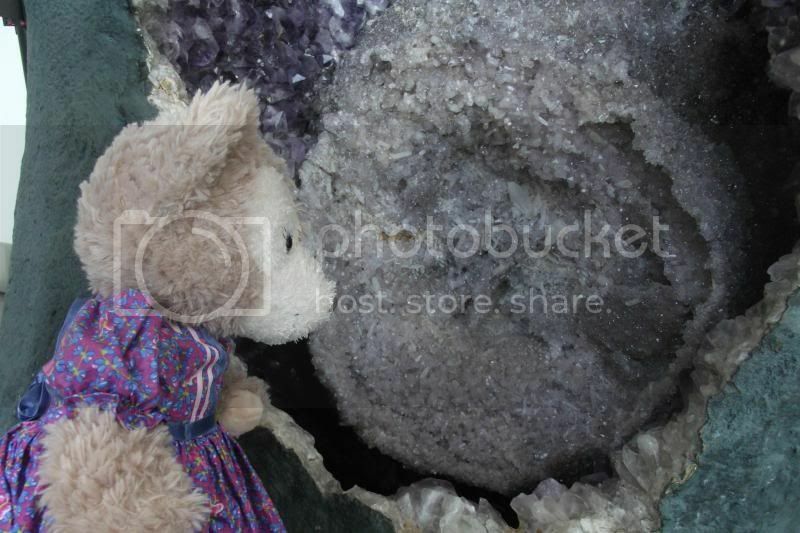 "Ooo, that is so sparkly and pretty. 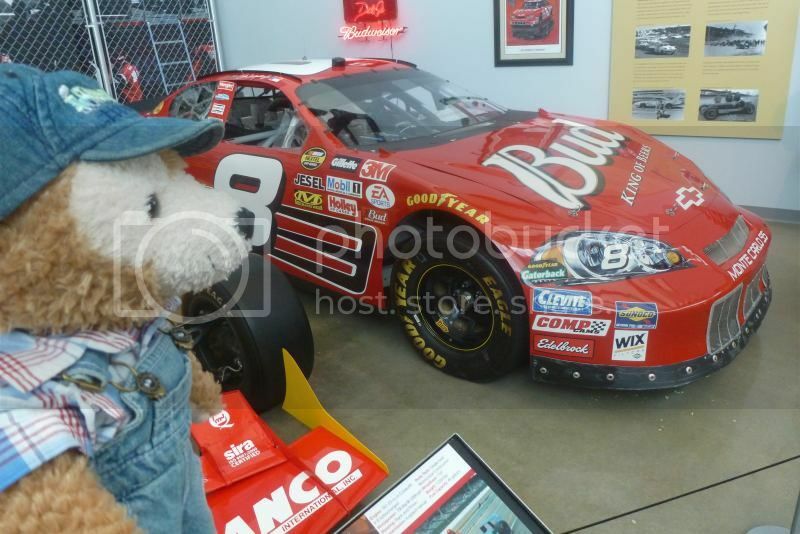 Thanks for pointing it out to me," Shellie May said politely. 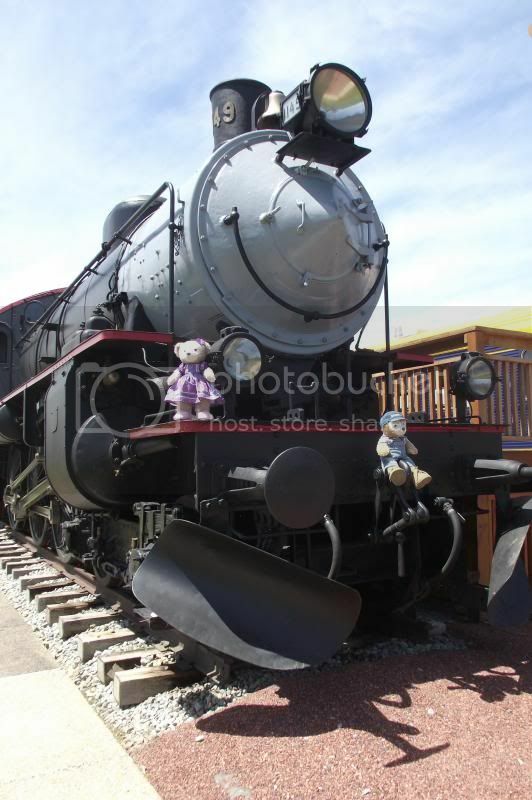 "Why don't you crawl inside and have your tender get your picture?" "Um, no thanks. 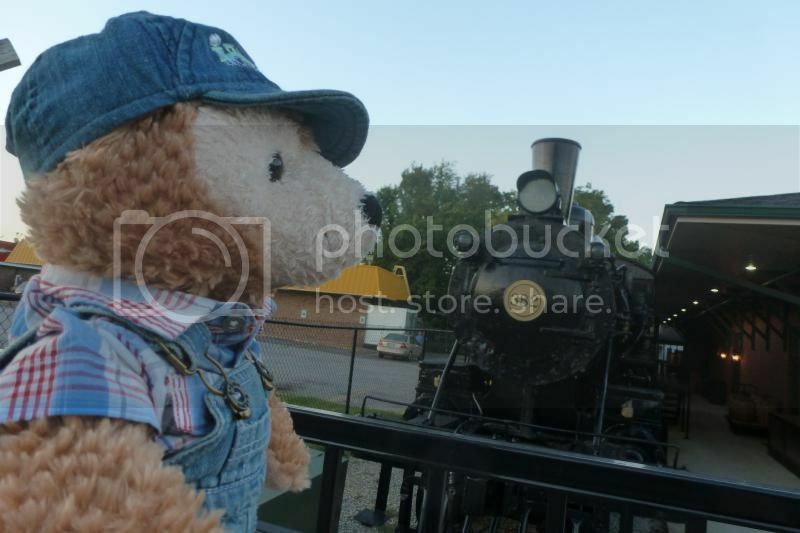 I can see it fine from here," Shellie May said hesitantly. I told Kaylee that Shellie May was living unloved in Ohio and her previous tender stuffed her in a shoe box and closed the lid on her for her journey to Tennessee so even though she recovered from the trauma she is still leery of small spaces. 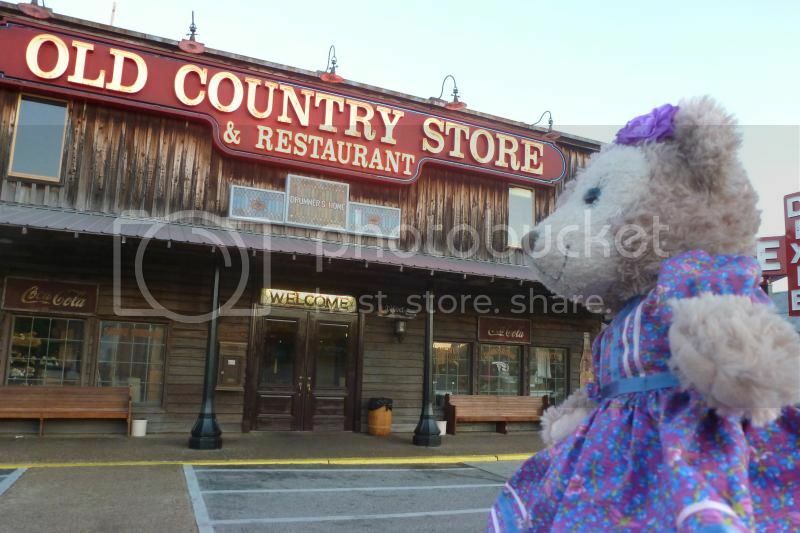 Another girl asked her parents as she was walking by looking at Shellie May, "Is there a Build-A-Bear here?" "Har-umph!" said Shellie May. "I am NOT a Build-A-Bear!" 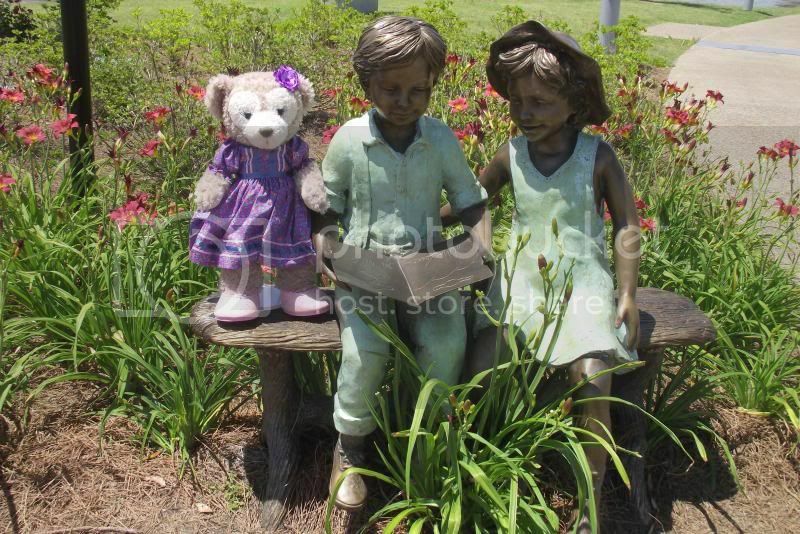 Well, I knew what was coming next so I quickly scooped Shellie May up before she could moon the innocent child. "Shellie May is from Disney," I informed the little girl quickly as we walked away as fast as we could. 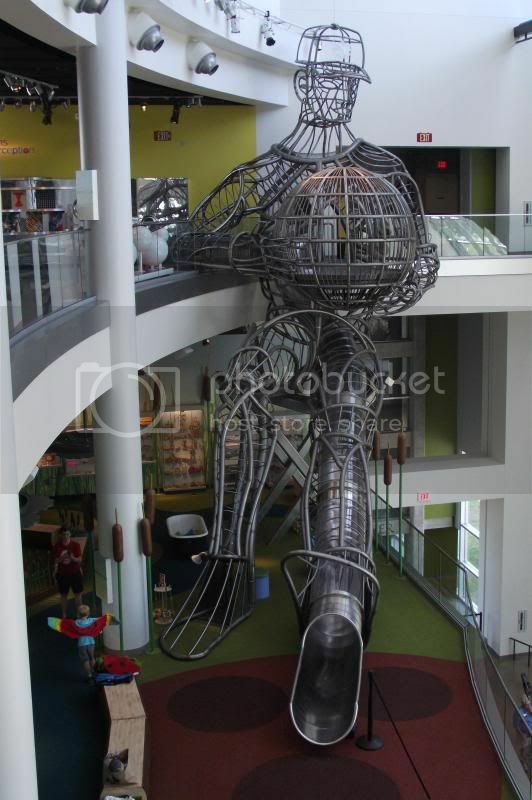 There is a 30 foot tall slide made out of metal in the shape of a human.. If the human was standing it would be 42 feet tall. I went down first to test it, as people of all ages are welcome to try it. Then Duffy and Shellie May held paws and went down together. 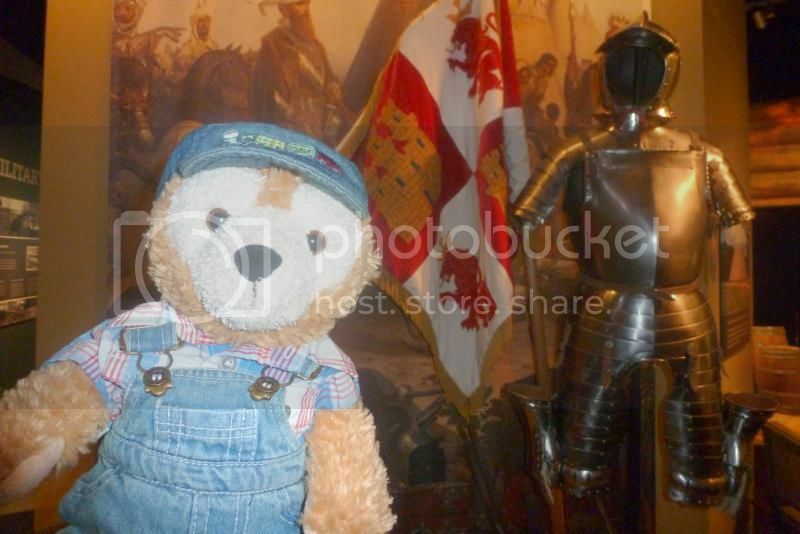 Duffy posed next to several knights, after learning about Hernando De Soto landing in Florida. 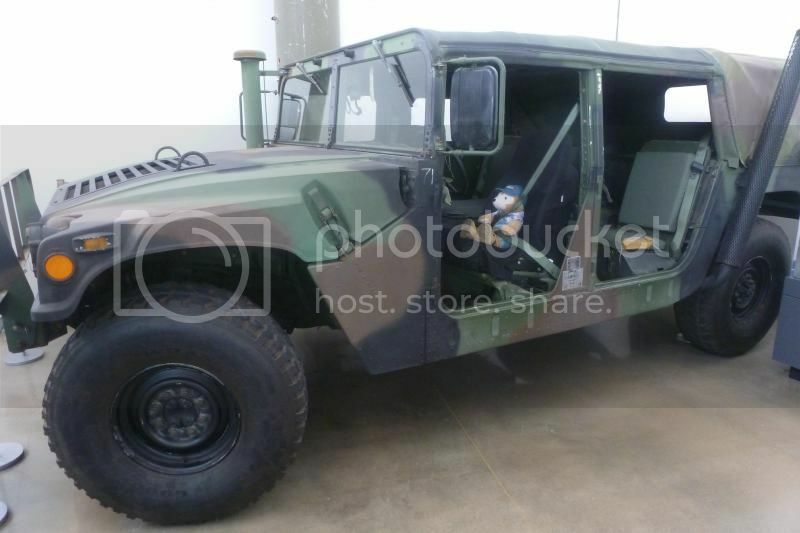 There was a large military section. 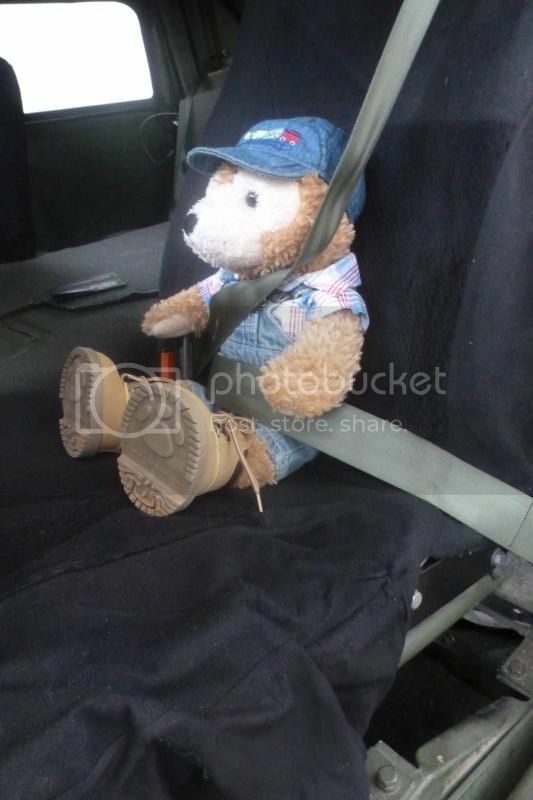 Duffy sat in a jeep. 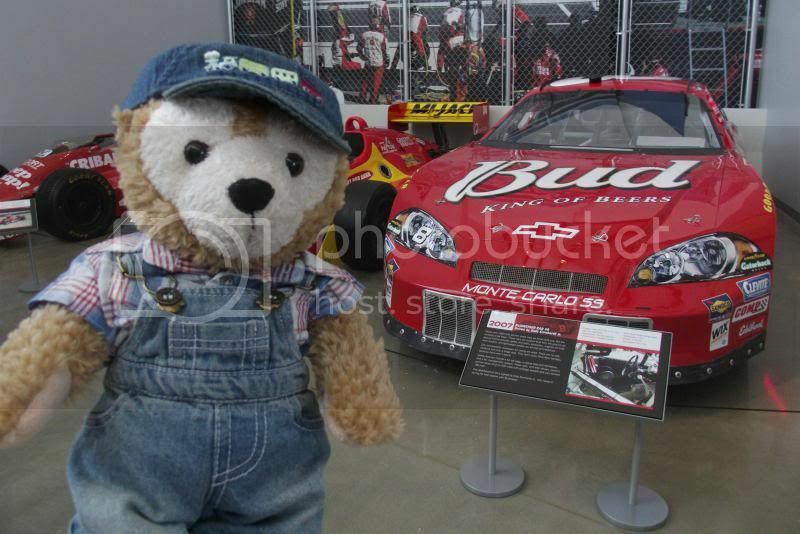 His eyes lit up when we got to the racecar display. "I'm gonna zoom, zoom, zooma, zoom!" he said. 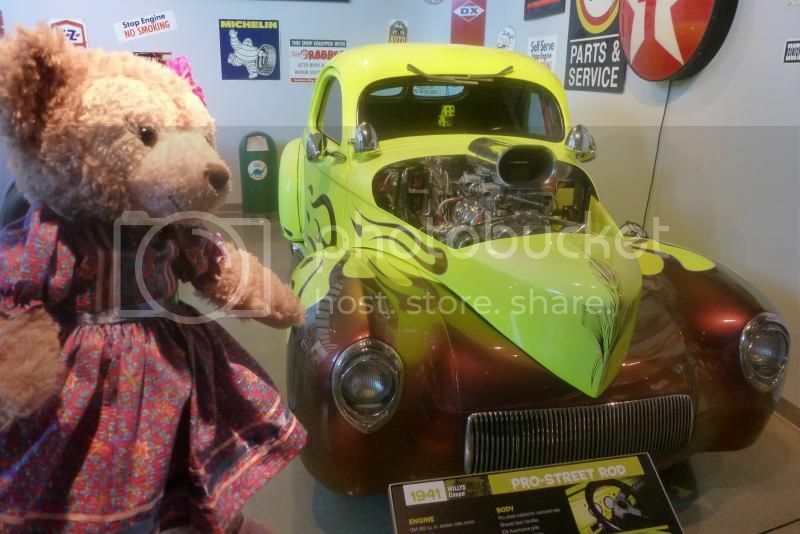 "I like this one," said Shellie May next to the 1941 Pro Street Rod. "Wow, that's bright! 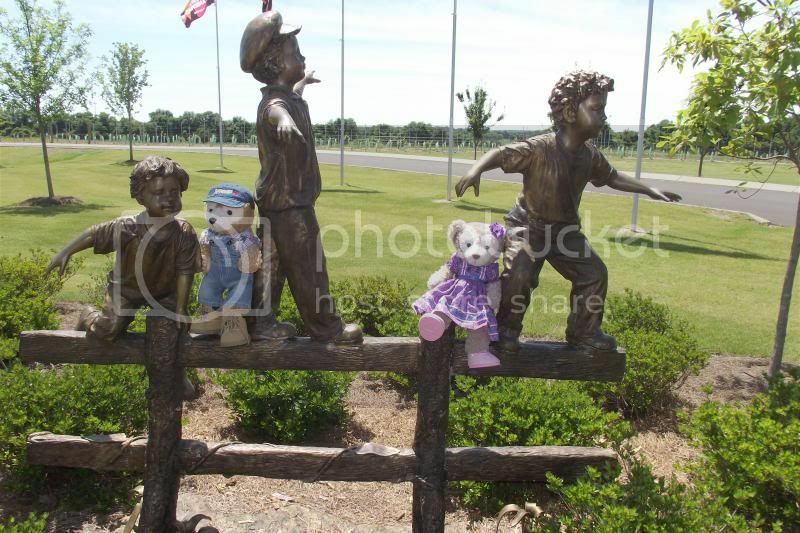 They'd see you coming from a mile away," said Duffy. "That's the idea," replied Shellie May. "Outta my way people. I'm coming through. 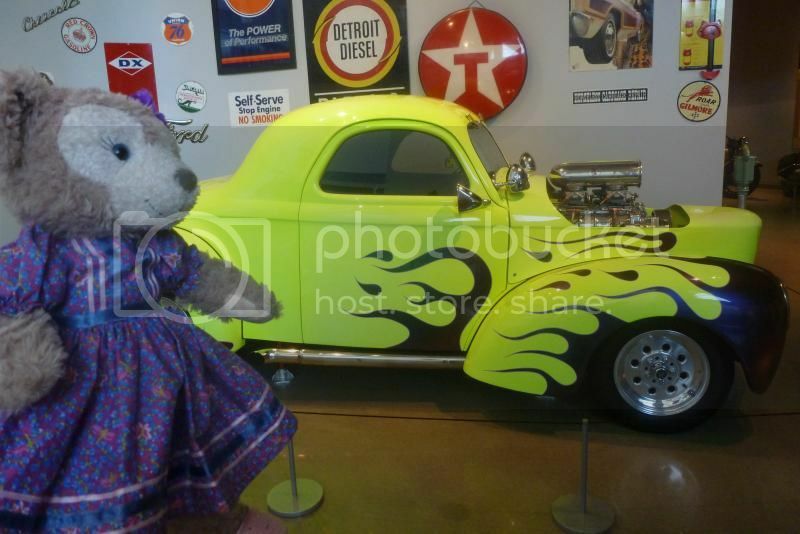 And I don't even have a license yet, TEE HEE!" she said impishly. "Do you like this one better?" 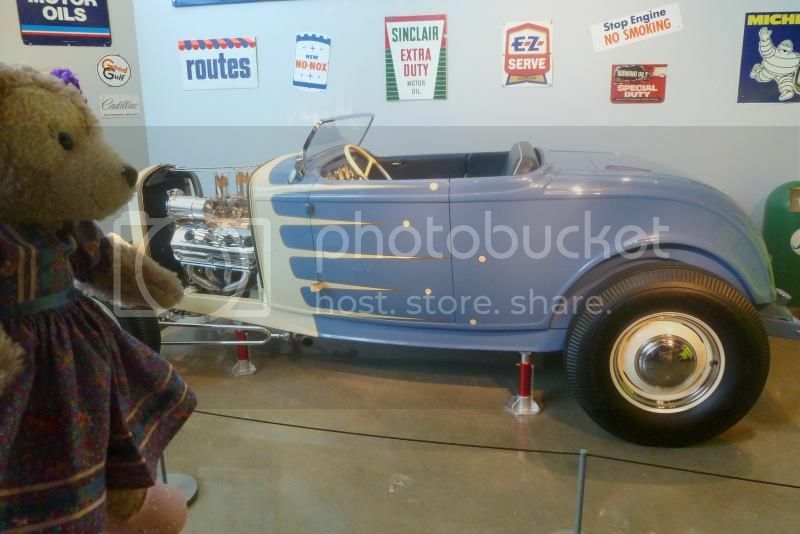 she asked of the 1932 Ford Triple Crown. 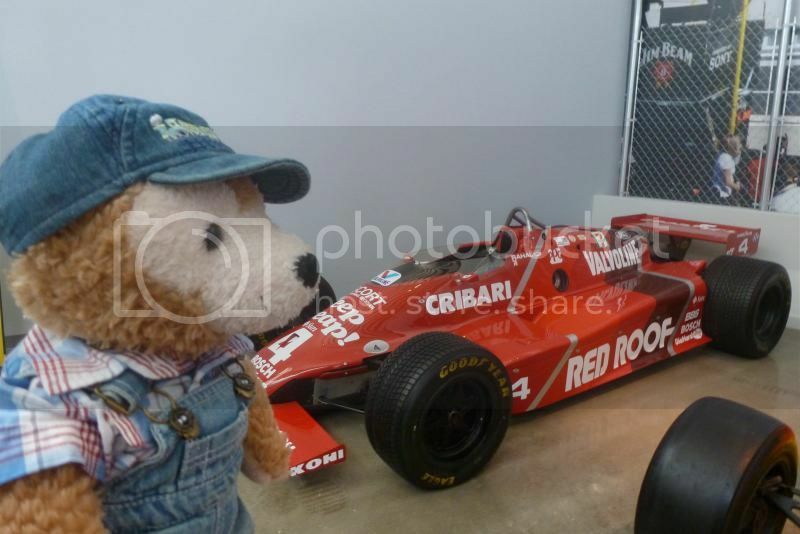 "Um, maybe you better leave the driving to me," said Duffy. "Maybe you two should leave the driving to ME!" 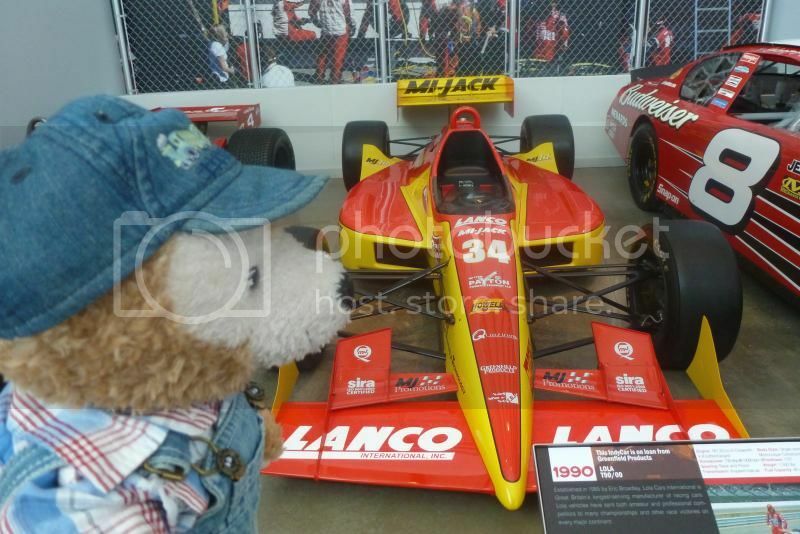 I told them, since Duffy's car won't have enough gas to go 180 miles! Hours later we finally made it outside. 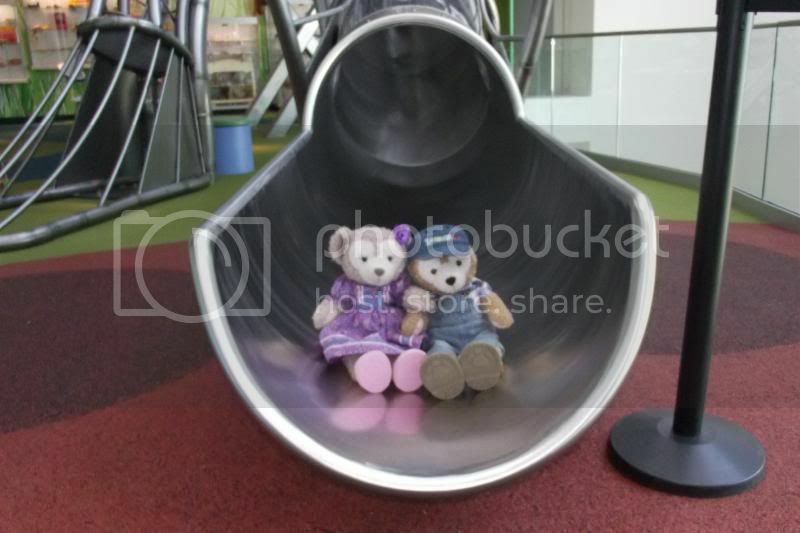 "We can do that," said Duffy and Shellie May as they climbed up. 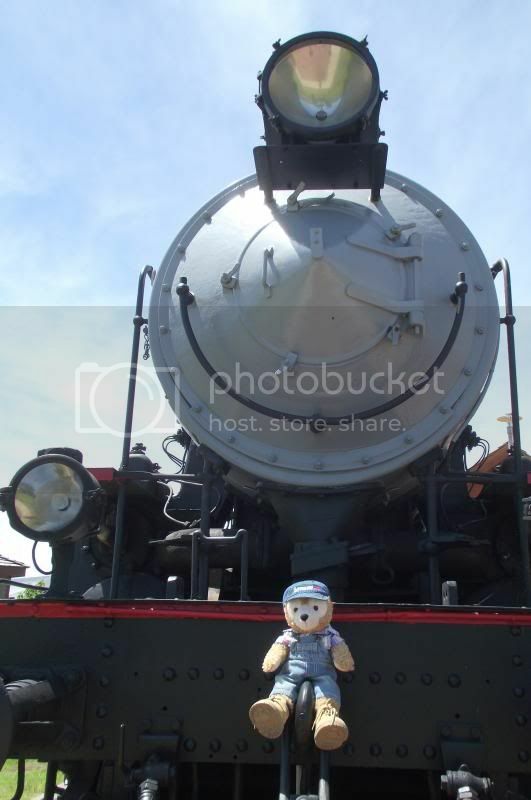 "Oh, boy, more trains!" said Duffy later. "This place definitely gets my 'way cool' rating." I have to agree. There is such a variety there that I can't imagine anyone being bored. Note, though, that no backpacks or large bags are allowed and the outdoor cafe only accepts cash. I would suggest doing the add-ons first thing before it gets crowded (the tower, the earthquake simulator, and the starship theatre, which is the only attraction of its kind in the country). Needless to say, I did not hear a peep out of them the whole way home because they climbed into their car seats and promptly fell asleep. 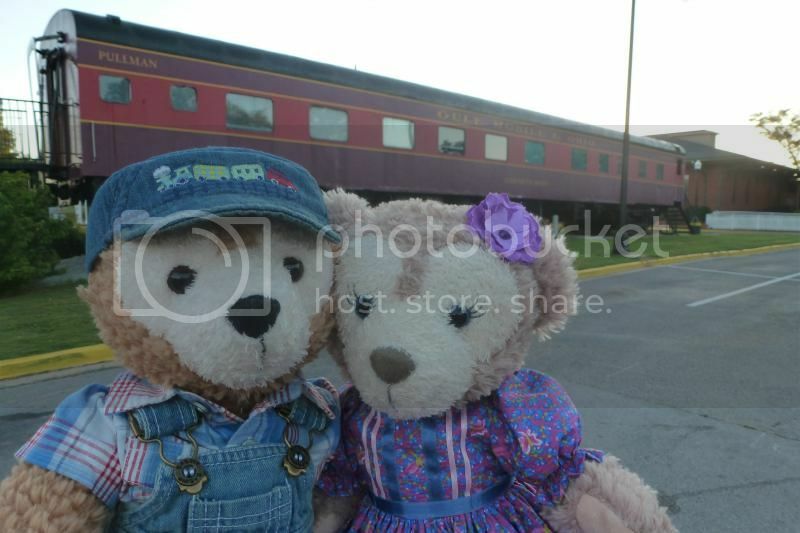 I always love seeing all the fun and educational places you travel to with Duffy and Shellie, Jill. 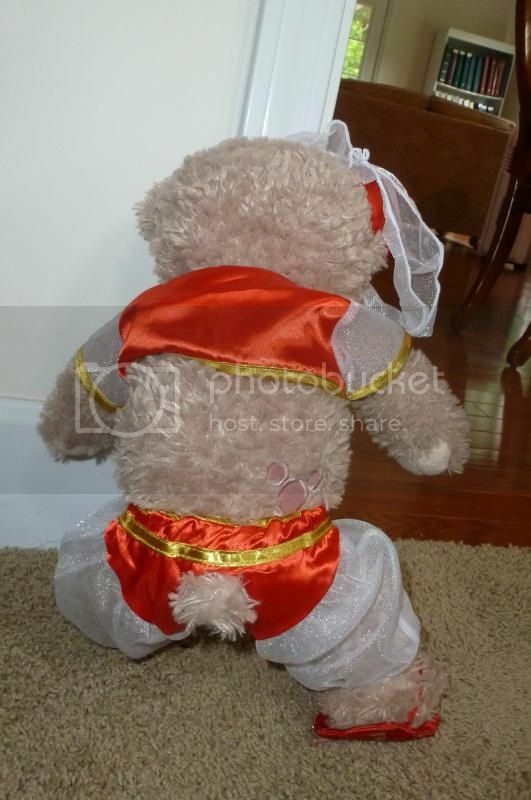 Your stories have a great narrative and I must say you have some of the most well dressed bears I've ever seen! 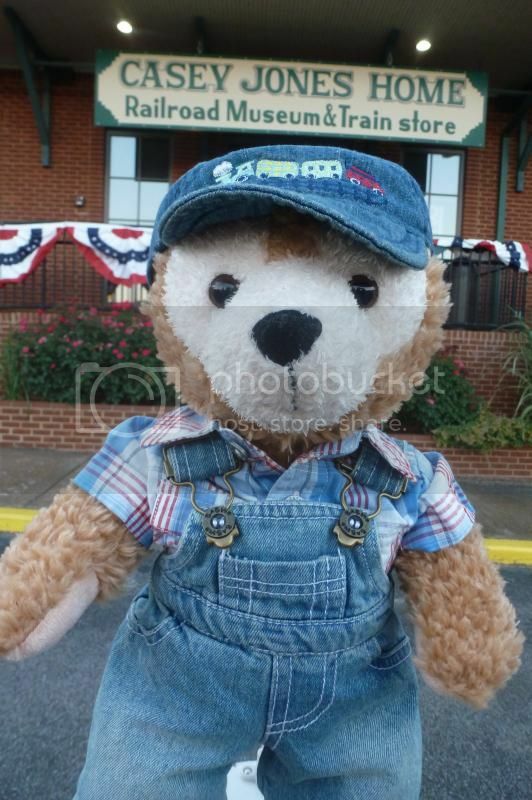 Where did you get Duffy's cute train hat?